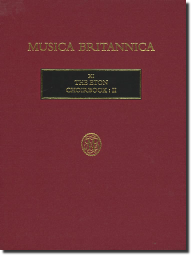 18 late 15th-century polyphonic antiphons by Banester, Browne, Cornysh, Davy, Fawkyner, Fayrfax, Hampton, Hacomplaynt, Horwood, Huchyn, Hygons, Sutton and Wylkynson. The latest edition more accurately reflects the coloration of the original manuscript. First published in 1958, revised 1973 and 2002.